The workshop “How to make my research more responsible? 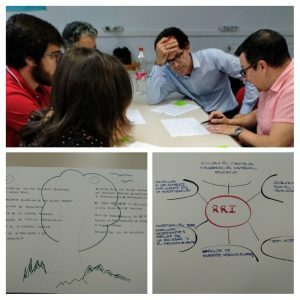 Exploring RRI” took place at the Politécnica University of Madrid last Thursday October 11th. The training was addressed to active researchers interested in targeting the scientific process with responsibility, as it is currently defined by the European Comission. Carolina Llorente from the Science, Communication and Society Studies Centre guided the session. This course is part of the training program of the European project GRECO. UPF is part of the Project GRECO, a European initiative that gets together six different nationalities in order to put Open Science into practice inside a photovoltaic innovation project. GRECO wants to demonstrate that a stronger social involvement leads to an improved acceptance and use of innovation products in this field. Based on RRI and citizen participation, GRECO proposes solutions to increase solar cell technology lifetime, reduce the costs, increase performance and support new uses in agriculture and architecture. Approximately 20 people from different research centres attended the session that lasted four hours. During this time, scientists reflected and debated about the concept and practice of Responsible Research and Innovation (RRI). The course materials were adapted from the recently ended project HEIRRI, approaching issues like inclusion, citizen participation, sustainability, ethics and gender equality.